When your computing needs change, you can modify your Standard or Convertible Reserved Instances and continue to benefit from the billing benefit. You can modify the Availability Zone, scope, network platform, or instance size (within the same instance family) of your Reserved Instance. To modify a Reserved Instance, you specify the Reserved Instances that you want to modify, and you specify one or more target configurations. You can also exchange a Convertible Reserved Instance for another Convertible Reserved Instance with a different configuration, including instance family. For more information, see Exchanging Convertible Reserved Instances. You can modify all or a subset of your Reserved Instances. You can separate your original Reserved Instances into two or more new Reserved Instances. For example, if you have a reservation for 10 instances in us-east-1a and decide to move 5 instances to us-east-1b, the modification request results in two new reservations: one for 5 instances in us-east-1a and the other for 5 instances in us-east-1b. You can also merge two or more Reserved Instances into a single Reserved Instance. For example, if you have four t2.small Reserved Instances of one instance each, you can merge them to create one t2.large Reserved Instance. For more information, see Support For Modifying Instance Sizes. After modification, the benefit of the Reserved Instances is applied only to instances that match the new parameters. For example, if you change the Availability Zone of a reservation, the capacity reservation and pricing benefits are automatically applied to instance usage in the new Availability Zone. Instances that no longer match the new parameters are charged at the On-Demand rate unless your account has other applicable reservations. The modified reservation becomes effective immediately and the pricing benefit is applied to the new instances beginning at the hour of the modification request. For example, if you successfully modify your reservations at 9:15PM, the pricing benefit transfers to your new instance at 9:00PM. (You can get the effective date of the modified Reserved Instances by using the DescribeReservedInstances API action or the describe-reserved-instances command (AWS CLI). The original reservation is retired. Its end date is the start date of the new reservation, and the end date of the new reservation is the same as the end date of the original Reserved Instance. If you modify a three-year reservation that had 16 months left in its term, the resulting modified reservation is a 16-month reservation with the same end date as the original one. The modified reservation lists a $0 fixed price and not the fixed price of the original reservation. The fixed price of the modified reservation does not affect the discount pricing tier calculations applied to your account, which are based on the fixed price of the original reservation. If your modification request fails, your Reserved Instances maintain their original configuration, and are immediately available for another modification request. There is no fee for modification, and you do not receive any new bills or invoices. You can modify your reservations as frequently as you like, but you cannot change or cancel a pending modification request after you submit it. After the modification has completed successfully, you can submit another modification request to roll back any changes you made, if needed. You can modify these attributes as follows. If you change the scope from Availability Zone to Region, you lose the capacity reservation benefit. If you change the scope from Region to Availability Zone, you lose Availability Zone flexibility and instance size flexibility (if applicable). For more information, see How Reserved Instances Are Applied. To change the instance size within the same instance family, the reservation must use Amazon Linux on default tenancy. Some instance families are not supported, because there are no other sizes available. For more information, see Support For Modifying Instance Sizes. The network platform must be available in your AWS account. If you created your AWS account after 2013-12-04, it does not support EC2-Classic. There must be a match between the instance size footprint of the active reservation and the target configuration. For more information, see Support For Modifying Instance Sizes. If you have Amazon Linux reservations in an instance family with multiple sizes, you can modify the instance size of your Reserved Instances. Instances are grouped by family (based on storage, or CPU capacity); type (designed for specific use cases); and size. For example, the c4 instance family is in the Compute optimized family and is available in multiple sizes. While c3 instances are in the same family, you can't modify c4 instances into c3 instances because they have different hardware specifications. For more information, see Amazon EC2 Instance Types. You cannot modify the instance size of the Reserved Instances for the following instance types, because only one size is available for each of the instance families. Each Reserved Instance has an instance size footprint, which is determined by the normalization factor of the instance type and the number of instances in the reservation. When you modify a Reserved Instance, the footprint of the target configuration must match that of the original configuration, otherwise the modification request is not processed. The normalization factor is based on instance size within the instance family (for example, m1.xlarge instances within the m1 instance family). This is only meaningful within the same instance family. Instance types cannot be modified from one family to another. In the Amazon EC2 console, the normalization factor is measured in units. The following table illustrates the normalization factor that applies within an instance family. To calculate the instance size footprint of a Reserved Instance, multiply the number of instances by the normalization factor. For example, a t2.medium has a normalization factor of 2 so a reservation for four t2.medium instances has a footprint of 8 units. You can allocate your reservations into different instance sizes across the same instance family, for example, across the T2 instance family, as long as the instance size footprint of your reservation remains the same. For example, you can divide a reservation for one t2.large (1 x 4) instance into four t2.small (4 x 1) instances, or you can combine a reservation for four t2.small instances into one t2.large instance. However, you cannot change your reservation for two t2.small (2 x 1) instances into one t2.large (1 x 4) instance. This is because the existing instance size footprint of your current reservation is smaller than the proposed reservation. In the following example, you have a reservation with two t2.micro instances (giving you a footprint of 1) and a reservation with one t2.small instance (giving you a footprint of 1). 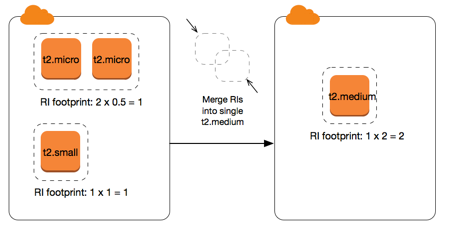 You merge both reservations to a single reservation with one t2.medium instance—the combined instance size footprint of the two original reservations equals the footprint of the modified reservation. You can also modify a reservation to divide it into two or more reservations. In the following example, you have a reservation with a t2.medium instance. You divide the reservation into a reservation with two t2.nano instances and a reservation with three t2.micro instances. You can modify .metal Reserved Instances into other sizes within the same family, and, similarly, you can modify other sized Reserved Instances in the same family into .metal Reserved Instances. A bare metal instance is the same size as the largest instance within the same instance family. For example, an i3.metal is the same size as an i3.16xlarge, so they have the same normalization factor. The .metal instance sizes do not have a single normalization factor. They vary based on the specific instance family. An i3.16xlarge is the same size as an i3.metal instance, so its normalization factor is 128 (128/1). The reservation for one i3.metal instance can be modified into one i3.16xlarge instance. An i3.8xlarge is half the size of an i3.metal instance, so its normalization factor is 64 (128/2). The reservation for one i3.metal instance can be divided into two i3.8xlarge instances. An i3.4xlarge is a quarter the size of an i3.metal instance, so its normalization factor is 32 (128/4). The reservation for one i3.metal instance can be divided into four i3.4xlarge instances. You can modify your Reserved Instances using the Amazon EC2 console, the Amazon EC2 API, or a command line tool. Before you modify your Reserved Instances, ensure that you have read the applicable restrictions. If you are modifying instance size, ensure that you've calculated the total instance size footprint of the reservations that you want to modify and ensure that it matches the total instance size footprint of your target configurations. On the Reserved Instances page, select one or more Reserved Instances to modify, and choose Modify Reserved Instances. If your Reserved Instances are not in the active state or cannot be modified, Modify Reserved Instances is disabled. Scope: Choose whether the Reserved Instance applies to an Availability Zone or to the whole Region. Availability Zone: Choose the required Availability Zone. Not applicable for regional Reserved Instances. Instance Type: Select the required instance type. Only available for supported platforms. For more information, see Requirements and Restrictions for Modification. Count: Specify the number of instances to be covered by the reservation. If your combined target configurations are larger or smaller than the instance size footprint of your original Reserved Instances, the allocated total in the Units column displays in red. To confirm your modification choices when you finish specifying your target configurations, choose Submit Modifications. If you change your mind at any point, choose Cancel to exit the wizard. You can determine the status of your modification request by looking at the State column in the Reserved Instances screen. The following table illustrates the possible State values. Transition state for original Reserved Instances. Transition state for original Reserved Instances while new Reserved Instances are being created. Reserved Instances successfully modified and replaced. New Reserved Instances created from a successful modification request. Original Reserved Instances after a failed modification request. The state returned shows your request as processing, fulfilled, or failed. If the target configuration settings that you requested were unique, you receive a message that your request is being processed. At this point, Amazon EC2 has only determined that the parameters of your modification request are valid. Your modification request can still fail during processing due to unavailable capacity. In some situations, you might get a message indicating incomplete or failed modification requests instead of a confirmation. Use the information in such messages as a starting point for resubmitting another modification request. Ensure that you have read the applicable restrictions before submitting the request. Amazon EC2 identifies and lists the Reserved Instances that cannot be modified. If you receive a message like this, go to the Reserved Instances page in the Amazon EC2 console and check the information for the Reserved Instances. You submitted one or more Reserved Instances for modification and none of your requests can be processed. Depending on the number of reservations you are modifying, you can get different versions of the message. Amazon EC2 displays the reasons why your request cannot be processed. For example, you might have specified the same target configuration—a combination of Availability Zone and platform—for one or more subsets of the Reserved Instances you are modifying. Try submitting the modification requests again, but ensure that the instance details of the reservations match, and that the target configurations for all subsets being modified are unique.